The Episcopal Church added Oscar Romero to our calendar of Lesser Feasts back in 2006, but today is the first time the Roman Catholic Church will celebrate his sainthood since he was canonized on October 14, 2018. 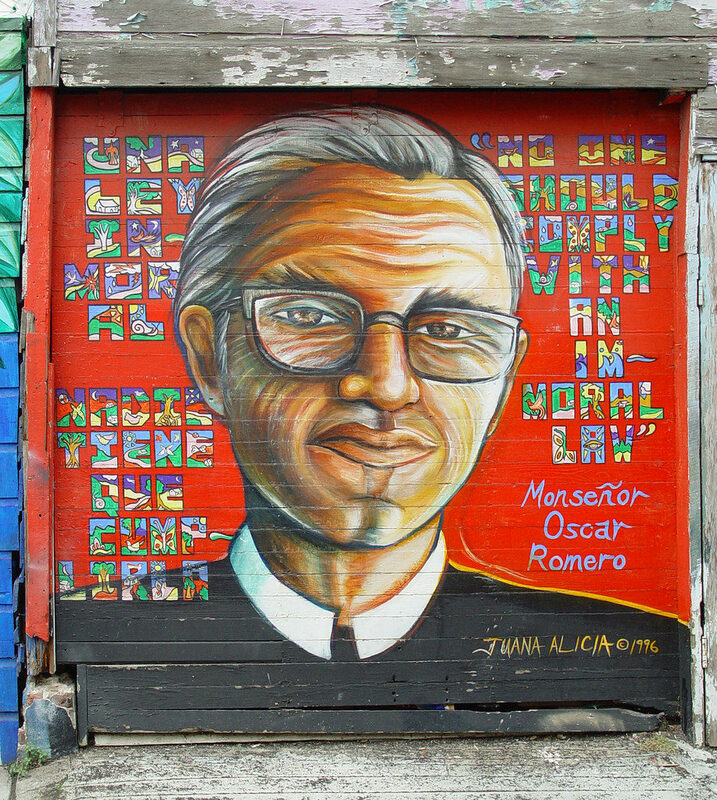 We know Oscar Romero because of his outspoken liberation theology, but that is not what marked the majority of his ordained life. When he was appointed Archbishop of San Salvador in 1977 at the age of sixty, El Salvador was full of widespread political violence, abductions and human rights violations. It was a time when 2% of the country’s population controlled 60% of farmable land. Many Salvadorian clergy advocated on behalf of and alongside the poor and oppressed, but Oscar Romero did not. And then his friend and clergy colleague Rutilio Grande was murdered. This is how it typically happens, right? We aren’t involved in a particular issue until it hits us close to home. When Rutilio Grande was murdered for his work organizing impoverished rural farmers and criticizing the corrupt government, Romero could no longer ignore what was happening around him. Romero immediately traveled to the town where Grande was killed to celebrate mass in his church. The following Sunday Romero celebrated a memorial mass in the San Salvador cathedral, serving as the singular mass that day for the entire country. More than 150 priests participated in the service and over 100,000 people attended. Romero preached a sermon that launched him right into the spotlight. He publicly denounced the military’s violence and the systemic marginalization of farmers, while urging people to live out Jesus commandment to love their neighbors. People who weren’t able to hear Archbishop Romero in person could tune in to hear his weekly radio homilies broadcast all over El Salvador. Soon these sermons evolved into the only trusted source of news updates for Salvadorians. Major media outlets were prohibited from reporting on the military violence, but Romero refused to be silenced and censored. Every single Sunday he recounted the week’s tortures, murders, and abductions carried out on both sides of the country’s civil war. He preached hour long sermons calling for agrarian reform and an end to violence. He became known as the investigative journalist for the poor and oppressed. With such criticism of the government and military, it’s no surprise that Archbishop Romero’s radio station was frequently intercepted and bombed. Even that wouldn’t stop him from preaching his message of justice. In one of his sermons, Archbishop Romero stated that people must remember that if his radio station no longer exists, they must carry on this critical work. Archbishop Romero was a loud microphone. So loud that he was assassinated while presiding at the altar on this day in 1980. It can be difficult to talk with young, inquisitive children about martyrs without wading into the deep waters of frightening details. I recognize in this post alone I’ve used the words assassinated, murdered, killed and bombed. We tend to avoid these topics with children, much like Oscar Romero avoided the conflict within his country the first 35 years of his ordained life. However, this feast day offers a wonderful opportunity to talk with children about speaking up and speaking with the marginalized. We can share stories from Archbishop Romero’s life to remind children (and ourselves!) that we must be God’s microphones. We can identify classmates who need a friend, people in the community working for justice who need additional voices on their side, legislators who need to hear from their constituents before voting on policies. We can talk about the times when we see something wrong but are afraid to speak up about it. And then, we can talk through what makes us afraid in those situations. Oscar Romero shows us how to live our faith as a microphone of God. His is a message that translates to all people, no matter how young they are. Thank you, Allison, for this valuable reflection on Romero. He is one of my favorite saints. Your reflection at the end about the difficulty in sharing this story with our children, a story with words like assassinated, murdered, killed, and bombed reminded me that Mr. Rogers dealt with this early in his time following the assassination of Bobby Kennedy. As I remember, he dealt with it gently, but directly. You have made me want to go track down those episodes to see how he dealt with it.